Tomoyuki Hoshino says that he really gets into the feel of the clay that he works with, and that being aware of the histories and traditions that are involved in the making of ceramics is perhaps the most important thing when it comes to getting him ready for doing work. Harmonizing with the clay when throwing on the wheel is vital for him. Most of the art craft is actually mental according to rare interviews that he’s granted. When he works on a wheel, he says that his own genes somehow get synchronized out with the clay that then gets drawn out in the spirals. It’s a truly interesting process, both to take part in as well as to watch. Of course, only a true master’s hand could really stand to work with this sort of material on a wheel. Hoshino Tomoyuki is perhaps most notable for his relationship with the clay, which can be seen in each of his works. 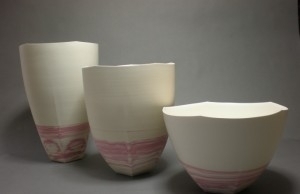 The artist generally uses porcelain clay as a main material, and then he combines a bunch of other techniques with it. His neritsugi, which is a melding of traditional neriage and dotsugi, is perhaps the best known. However, his use of red decorations along with a pale blue glaze should be every bit as noticeable to those who are examining his art with a practiced eye. Use of a traditional Japanese plane creates interesting edges across his pieces, but art appreciators may be surprised to hear that his upbringing was anything but traditional. He graduated from Yokohama City University with a degree in business administration back in 1999, and then ended up working in sales for 5 years after that. He didn’t actually complete any molding work in ceramics until 2005, but he worked with Ikai Yuichi and became a full member of the Kogei Association by 2013. 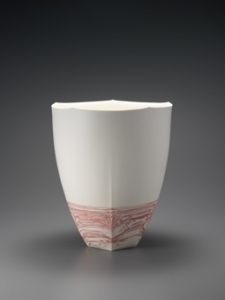 Most of Hoshino Tomoyuki’s pieces feature porcelain combined with a second material. Since then the artist has received several prominent awards and been selected fro the Kinki Exhibition and the Eastern Japan Traditional Art Crafts Exhibition in several years. Naturally those with an eye for art shouldn’t forget that his pieces would be on display here at Mizen until February 11, 2016. All of these exhibitions have had one central tenant shared between them, and that’s the fact that the artist does everything that he can to leave a lasting deep impression on the viewer when looking at his pieces. Even the most minimalist pieces, like the one neritsugi ceramic bowl referred to as « Kaku, » leave a very striking impression. In fact, they might very well do so more so since they’re void of unnecessary ornamentation.